THE restaurant King of Marbella is now aiming to conquer Madrid. Double Michelin-starred chef Dani Garcia has announced he will be opening a second branch of popular Puente Romano eatery Bibo in the capital. The plan is to make Bibo Madrid similar to the original restaurant, retaining the ‘democratisation of high cuisine’ ethos. In other words, his aim is to continue making Michelin-starred food accessible for all wallet sizes. Details of the second restaurants have not yet been confirmed, although rumours abound about Garcia finally cracking New York, a place he has had his sights set on for many years. Bibo Madrid will be located on Paseo de la Castellana and will be 800 metres-squared in size, according to the restaurant group’s announcement. 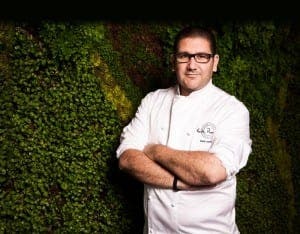 Garcia, 40, learnt his trade from Basque cooking legend Martin Berasategui before opening his first restaurant in 1998.